Congratulations to the organisations that were shortlisted for the 2019 NICE shared learning award. We received 68 entries from organisations across the NHS, local authorities, social care, and the voluntary and private sectors. The standard was extremely high. The finalists will present their work on the eve of this year’s NICE Conference in Manchester and attending delegates will vote for the winner. Posters of the 20 shortlisted case studies will be presented at the award evening and at the conference. 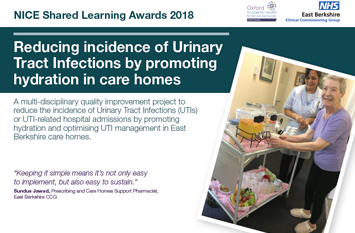 A multi-disciplinary quality improvement project to reduce the incidence of Urinary Tract Infections (UTIs) or UTI-related hospital admissions by promoting hydration and optimising UTI management in East Berkshire care homes. Keeping it simple means it’s not only easy to implement, but also easy to sustain. 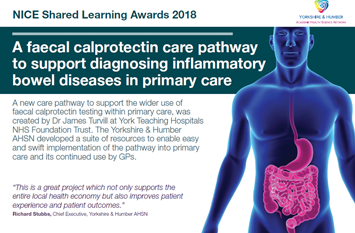 A new care pathway to support the wider use of faecal calprotectin testing within primary care. 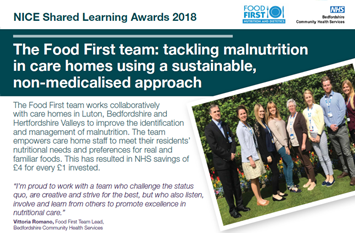 The Food First team works collaboratively with care homes to improve the identification and management of malnutrition.